If you haven't see 20 Feet From Stardom, I think you would like it. It has the perfect mix of story and music as far as I'm concerned. And I'm older than you. Crazy as it sounds, you might see if an acupuncturist will work with Sam on her allergies. I have a friend who has good results (no drugs and only a few treatments a year). Not all acupuncturists will work on kids, though. She sounds miserable, so it might be worth checking out. As a fairly new knitter, I get your frustration with knitting that first pair of socks. The first sock I made was so bad, I never made the mate. Couldn't face it! The second sock (first complete pair) I made had to go to my husband because, like yours, the circumference was too big and would only fit a man's foot. One secret I have is to always make ribbed socks now. Just a standard 2x2 rib, so that no matter how "wrong" my calculations are, the ribbing pulls the fabric in and I get a nice fit. I only rib the top of the foot (stockinette on the sole) and then I rib the entire leg. Also, I've found that not all sock yarn is the same thickness so maybe you made your first sock out of a slightly thicker sock-weight yarn and ended up with a larger circumference. I just wanted to give you some encouragement because hand-knit socks are soooo worth it!! It does sound like you might need to decrease more across the instep. It took me a few pairs of socks to start getting the hang of making them fit right (and I still sometimes make them too baggy around the ankle, which is my hardest spot to fit). Also, your wavy Baktus looks awesome! I made the lacy version a couple years ago and I love it -- it's my favorite scarf. This has been a tough year for allergies with us as well. We took Grace to the allergist, and he was surprised that she didn't react more considering how swollen her nasal passages were. One thing we have realized is that we weren't giving the medicine enough time to work. He said that 10 days on the nasal steroid or allergy medicine is not enough to tell if it is working - that you don't really know until about six weeks. I had never stuck with it that long. Thanks for the wardrobe talk. I think your comment on my blog post definitely sparked some of that conversation, and I have saved it to my phone for when I'm out shopping. It is extremely helpful, and I really appreciate it! Also, now I have to read that book. 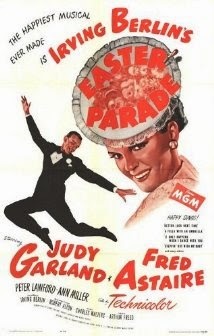 are walking in the easter parade.